Thou shalt not wear a shirt and tie at a lobster shack near a New Hampshire beach. Thou shalt not invoke upscale grocery stores while campaigning in farm-rich Iowa. And thou shalt not call South Carolina's Lowcountry "the lowlands." Former New York Mayor Rudy Giuliani made a trip this summer to a tourist-filled lobster shack in Seabrook, N.H. In sweltering heat, the Republican rolled up in his black SUV wearing a bold red tie and crisp white shirt. Fellow Republican Mitt Romney went through the same hazing ritual, tie tight and lobster in hand. Laughter - including from wife Ann - followed. And in South Carolina - where the H is silent in Horry Country - the names matter. Democratic Sen. Hillary Rodham Clinton, who mastered most of the names during her husband's campaigns, goofed by calling the state's coastal area "the lowlands" rather than the preferred "Lowcountry." To be sure, campaigning in the early voting states is an art. Voters want to see would-be-presidents at their neighborhood store, serving up ice cream as Romney did in Kingston, N.H., awkwardly tossing a bright green T-shirt over his dress shirt and tie. "Part of the problem is that everyone tries to be so disciplined, golly, you worry about the spontaneity," said Kathy Sullivan, a former Democratic chairwoman in New Hampshire. 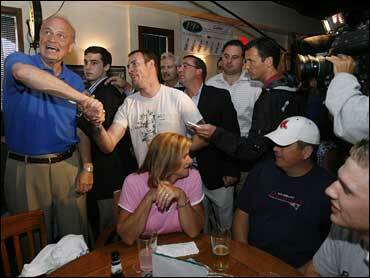 When Republican Fred Thompson stopped by a Manchester, N.H., sports bar recently, the customers were more interested in watching the New England Patriots than shaking hands with the "Law & Order" actor. The disruption - he and the throng of journalists standing in front of a big-screen television - prompted Thompson to take his cheeseburger back to his bus and forced his host, Manchester Mayor Frank Guinta, to offer up his untouched light beer to a nearby table. Republican Sen. John McCain raised eyebrows among South Carolina GOP voters, who are overwhelmingly religious conservatives, by saying he considers himself a Baptist and attends a Baptist church at home in Arizona. For decades McCain had publicly identified his religion as Episcopalian. His follow-up that he "didn't find it necessary" to be baptized in his adoptive Baptist church further puzzled voters, many of them Southern Baptists. Don't schedule a trip without looking at a map, as aides to former Sen. John Edwards apparently did when they promoted a campaign swing through New Hampshire's North Country, but included stops far from that region. Don't forget where you are, as Giuliani apparently did when he referred to "the people here in Massachusetts" during a speech in New Hampshire. Not quite as bad, Obama repeatedly called New Hampshire's Belknap County "Bell Camp" during an early trip. Don't get the name of the party chairman wrong, as Romney did with Fergus Cullen at a New Hampshire Republican gala. Romney called him Angus, a name Cullen has embraced as a joke. Don't assume food comes ready to eat, as candidates in South Carolina have done. In that state, political barbecue means roasted pig and hands-on messiness. "You peel shrimp and shuck oysters," said Romney political consultant Warren Tompkins. More than 20 years later, some remember when Walter Mondale didn't peel and got more than a mouthful. But Kerry's biggest of-the-people mistake was visiting South Philadelphia and ordering a cheese steak - with Swiss. It was a punchline for weeks.